Can the DOE Kick-Start Offshore Wind in the US? 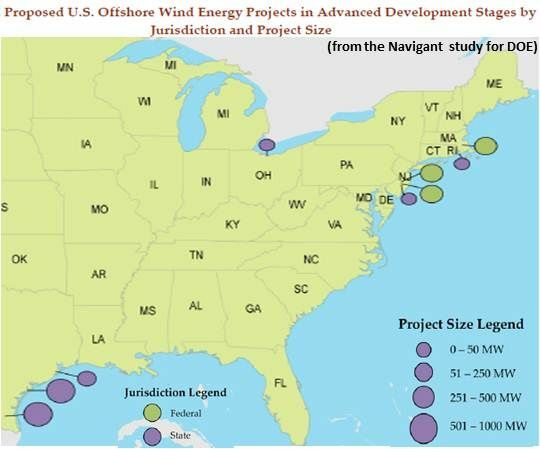 The U.S. has 33 offshore wind projects in varying stages of development. 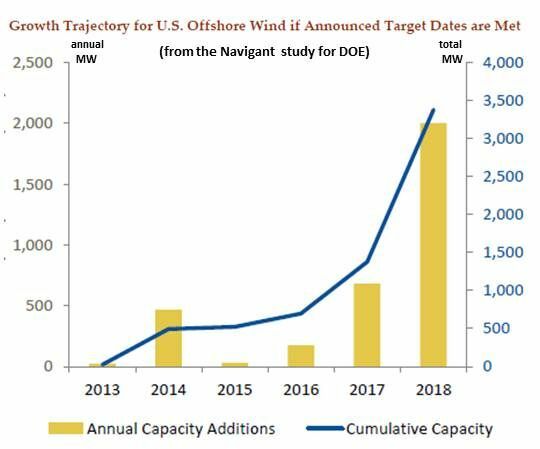 While there are nearly four gigawatts of installed offshore wind capacity in Europe and China, the U.S. has no operational projects in the water, and its nine advanced-stage plans, representing 3,380 megawatts of potential capacity, face challenges, according to a new study on the industry by Navigant Consulting that was conducted for the U.S. Department of Energy (DOE). To further drive U.S. offshore wind past those challenges and into commercial operation by 2017, the DOE awarded $28 million per year in Advanced Technology Demonstration funding for the next six years to seven projects that proved themselves with backing from DOE in 2011. 1. Baryonyx Corporation (Austin, Texas) will build three 6-megawatt direct-drive wind turbines in Texas’ Gulf of Mexico waters near Port Isabel to demonstrate an advanced jacket foundation design and integrate lessons learned from the oil and gas sector on hurricane-resistant design, building and safety. 2. Fishermen's Energy (Atlantic City) will build six direct-drive turbines three miles off the Atlantic City coast in New Jersey waters to demonstrate an advanced bottom-mounted foundation design and innovative installation procedures to mitigate potential environmental impacts. The company expects to be in commercial operation by 2015. 3. Lake Erie Energy Development Corporation (Cleveland, Ohio) will build nine 3-megawatt direct-drive wind turbines in Lake Erie, seven miles off Cleveland’s coast, to demonstrate "ice breaker" monopile foundations designed to reduce ice loading. 4. Principle Power (Seattle, Washington) will build five 6-megawatt direct-drive offshore wind turbines on semi-submersible floating foundations in deep water ten miles to fifteen miles off Coos Bay, Oregon to demonstrate how the semi-submersible foundations and turbines can be assembled in the water near the project site to reduce installation costs. 5. Statoil North America (NYSE:STO) (Stamford, Connecticut) will build four 3-megawatt wind turbines on floating spar buoy structures in the Gulf of Maine’s 460-foot deep waters off Boothbay Harbor to demonstrate the spar buoys and turbines can be assembled in harbor and towed to the project site to reduce installation costs. 6. The University of Maine (Orono, Maine) will build two 6-megawatt direct-drive turbines on floating concrete semi-submersible foundations near Monhegan Island to demonstrate potential cost-effective improvements in commercial-scale production of traditional steel foundations. 7. Dominion Virginia Power (NYSE:D) (Richmond, Virginia) will design, develop, and build two 6-megawatt direct-drive turbines off the coast of Virginia Beach to demonstrate innovative "twisted jacket" foundations that offer the strength of traditional jacket or space-frame structures but use substantially less steel. -The average nameplate offshore wind turbine has grown to 3.94 megawatts, likely has a monopile substructure and will soon be likely to have direct-drive generator technology. - Offshore wind is riskier, costlier, and harder to finance than land-based wind. - As offshore turbines grow bigger and more different from land-based turbines in all their systems, their costs will come down. 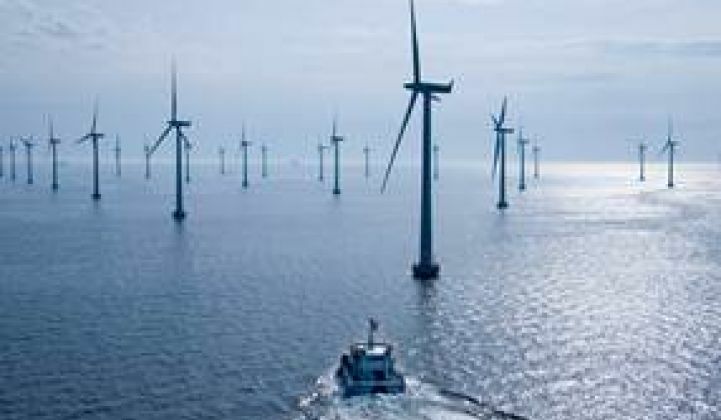 - U.S. offshore wind will need a fleet of dedicated vessels capable of installing and servicing the ever-bigger turbines in ever-deeper waters and upgraded ports that can handle the vessels and the turbines. - Like renewables onshore, offshore wind will require new transmission. - With better siting, new technologies and methods, and the right enhanced infrastructure, production will increase and costs will fall. - U.S. offshore wind’s three biggest challenges: high costs, inadequate infrastructure, uncertain policy and regulation. - Short-term policies should drive demand, including mandated long-term PPAs, RPSs with offshore wind carve-outs, directed ITCs/PTCs, directed low-interest loans and loan guarantees, accelerated depreciation, and feed-in tariffs. - Longer-term policies should be aimed at growing infrastructure and transmission. - Improved regulation would streamline siting and permitting. - Estimated capital cost of $3,040 million ($6,080/kW). - Estimated operations and maintenance (O&M) cost of $68 million/year ($136/kW-year). - Estimated 3,000 job-years and $584 million in local spending over the construction period. - Estimated 313 local jobs and $21 million in local spending per year of operation. 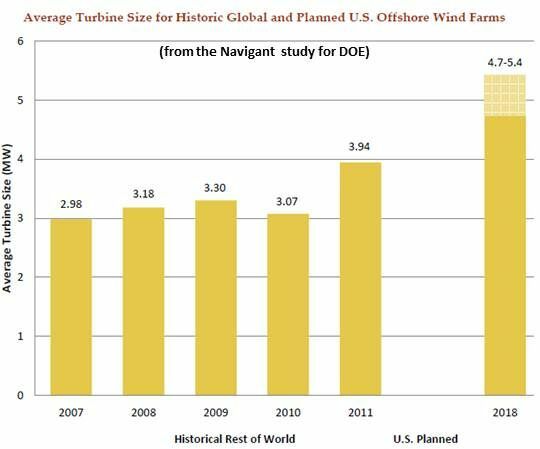 By 2030, the Navigant study concluded, the U.S. offshore wind industry could support ~50,000 to ~350,000 FTEs and drive ~$10 billion to ~$70 billion (in 2011 dollars). Whether it will be the high number or the low number depends on the evolution of other sectors in the economy, especially the price of natural gas and the change in coal-based generation capacity.